When nature decides a change is necessary, it happens in a hurry. While the U.S. Forest Service and its partners are using chainsaws to thin the forest down to a healthy balance, nature steps in with fire and mountain pine beetles. The red trees across the Black Hills National Forest are a testament to who's faster. Though environmental groups can't do much about nature's methods, they have been fighting the USFS forest management plan since it was introduced in 1997. A lawsuit, filed by Biodiversity Conservation Alliance, formerly known as Biodiversity Associates, and Brian Brademeyer, claimed the USFS plan, and an amendment to the plan that was approved in 2005, wasn't doing enough to manage the forest for wildlife. That lawsuit came to a conclusion–at least for the moment–Aug. 5, when the 10th Circuit Court of Appeals ruled in favor of the USFS. 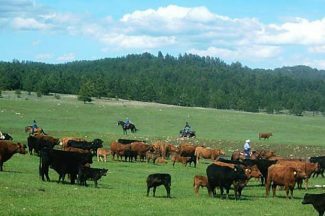 The states of South Dakota and Wyoming are listed as intervenors with the USFS on the lawsuit. "This decision is critical since both the state and federal mountain beetle efforts are intertwined and must be aggressive and consistent to address the destructive infestation," said South Dakota attorney general Marty Jackley in a press release. "While the environmentalist groups have been well intentioned, the pine beetle infestation requires a responsible forestry plan to protect our forest, wildlife, and surrounding private lands and this decision now allows us to continue with this much needed plan." Matt Mead, governor of Wyoming, also applauded the court's decision in a press release. "In this case we wanted to join the Forest Service in defending agriculture, the timber industry and the health of our forests. I am glad we prevailed. Bark beetles are devastating to our forests and to people who use the forests." The forest management plan focuses on making the Black Hills National Forest more diverse, as far as both plant and animal species go, said Dave Thom, Black Hills regional mountain pine beetle coordinator, and retired natural resources and planning staff officer for the USFS. Thom worked on the forest management plan amendment that was being challenged, and now works with 14 federal, state and private organizations to minimize the effects of the mountain pine beetles on the forest. The goal of the forest management plan was to get the Black Hills back to its historical balanced population of trees, Thom said. That includes having a broader age range of trees, and more species. Right now, the forest is heavily populated with Ponderosa pine trees that are around 100 years old, which is the kind of tree that is most susceptible to pine beetle attack. 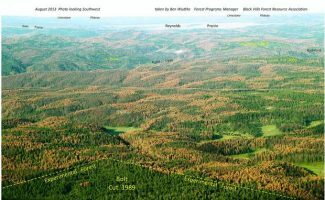 The age and density of the trees, drought stress and the natural cycle of the pine beetles have combined to allow the pine beetles to be successful to epidemic proportions—killing about 9.5 million trees in the Black Hills in the last four years, according to some estimates from the Black Hills Forest Resource Association. While the red of the dead and dying trees isn't pretty, it's important to remember that this is a natural response to a problem, said Bill Kohlbrand, district forester with Wyoming State Forestry Division. "The pine beetle is a natural pest. It's native to the area. It's nature's way of resetting things." Though the resetting may be necessary, it can be costly, said Ben Wudke, Forest Programs Manager with the Black Hills Forest Resource Association. "I'm not aware of any real numbers for the Black Hills area, but when you account for recreation, tourism, forest products, suppression costs, road clearing, and many others, the costs could be staggering, especially if we stood by and watched the epidemic unfold instead of taking a stand." Kohlbrand said the timber industry is cutting all the damaged trees they can get from state, federal and private land, but the wood is good for only a few months, up to a year after the beetles first move in. If the trees can be harvested while the beetles are still in the tree, it still has some value for raw lumber, but once the beetles leave the tree, the value goes down quickly. Part of the drop in value is from a fungus the beetles carry from tree to tree, which provides food for the larvae while they develop and helps kill the tree by killing the tissue that carries water through the tree. The fungus spreads a "blue stain" through the tree, which marks the lumber as beetle-killed. The beetles don't live in the cambuium layer, which is between the bark and the wood of the tree. They have to kill the tree so it doesn't "pitch out," or kill the beetles with sticky sap, it's natural defense against insects. The beetles "talk" to each other with pheromones, which they use to coordinate their attacks on receptive trees, and to tell other beetles when a tree is full. A few methods have been successful in slowing the spread of the beetles, and limiting their impact, Kohlbrand said. That includes a "cut and chunk" approach, which involves cutting down trees while the beetles are still in them, then cutting the trees into chunks, which dry out and kill the beetles before they can mature. This has been used in areas that timber harvest crews can't reach to remove the trees for lumber. "We tried to stay ahead of it on state land by adapting the timber program and logging where we were starting to get small infestations. As the problem got worse on Forest Service land, we were able to assist them with managing the beetles on their land," Kohlbrand said. Kohlbrand has been working on the pine beetle problem in Wyoming since 1981, when they saw the last pine beetle epidemic. "We made it through that in the '80s and we saw some signs of beetles flaring up in the '90s and we tried to mitigate that with timber sales immediately When we found small groups of trees we put a timber sale on it and tried to keep the forest healthy. 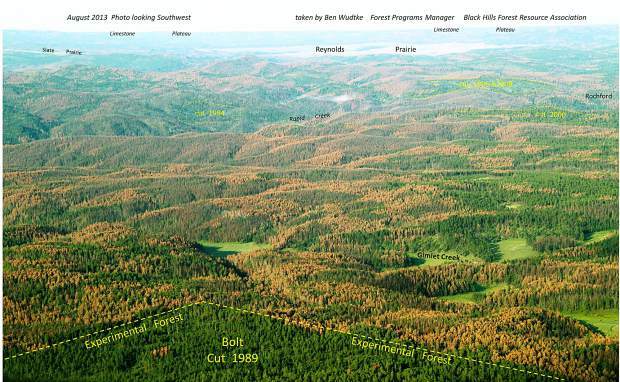 We've never really quit managing pine beetles." Brian Brademeyer did not respond to requests for comment.